We have been rated #1 on TripAdvisor under Specialty Lodging for the past three years running! Thank you to all of our wonderful guests for writing reviews! Click here to visit our TripAdvisor page. We had the privilege of hosting Elevation Outdoors Magazine in 2016. They stayed in the Boathouse and wrote a wonderful article about their visit to Creede. 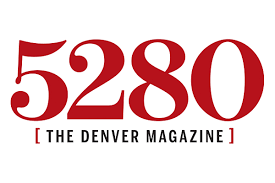 Creede, Colorado and Windsock Acres were featured in the September 2015 issue of 5280 Magazine. Creede was listed as one of seven small CO towns worth visiting. Read the full article here . "This property was truly an experience not just an overnight stay. Windsock Acres is a crown jewel of the quaint town of Creede with everything you need within a short walking distance. Linnaea met me at check in to give a guided tour and historical reference for the property. A nice bottle of red wine and a bottle of fizzy water welcomed me to the cabin. Hot muffins and oj were delivered in the morning. If visiting Creede during the summer months, the Creede Repertory Theater is a must and the Quiller Gallery and Arps Restaurant are open all year round. I have been visiting Creede for the past 30 years and have stayed at almost every guest ranch and motel in the area. The Cajun (and it's adjacent properties) is/are the nicest accommodation available in Creede proper." "Beautiful facility, immaculate attention to detail everywhere, fine hostess. Perfect for our 25th anniversary!" "Fabulous experience! Linnaea was super responsive and we got our dream house! The Boathouse was superb! Absolutely stunning detail, meticulously clean, and super cozy! We were super fortunate to meet the owners who went over and beyond to make us comfortable! Avery and Cat were so sweet and gave us suggestions how to make the most of our stay. Every morning we got a basket with fresh coffee and goodies. We highly recommend The Boathouse- it's simply the most spectacular place to stay in Creede." "The property is so charming and really 'made' the trip for us - [Linnaea was] the most charming of all things, and [the] granola is divine." "One of a kind experience! It was like sleeping in a beautiful hand crafted tree house. Every tiny detail in this room was carved by hand. The bed was very comfy. No shower but instead one of the best bathtubs ever. We saw pics, thought it might be kinda funky but the reviews were good and we took a chance. I'm so glad we did! The [Boathouse] is a reason to come back to Creede for us (and there are plenty more reasons...this one is just one more). We will be back! Thanks guys." "I love the Cajun Cabin. I want one please . Linnaea and Avery were both so friendly and welcoming. We will return!!" "Many thanks for your very warm, kind introduction to our stay at the 'Boathouse'. We had a lovely stay in the unique and beautiful surroundings. A special thanks for the extra special treat of the gluten-free quiche. It was absolutely delicious." "Those muffins were truly decedent! Thank you for everything; the food, the friendship, the information. We greatly appreciate it all and hope to return." "The cabins were artistic, comfortable and quiet. The owners & manager were so kind!!!" "We had such a wonderful time at Windsock Acres. The Cajun is a gorgeous home, with a great, full kitchen, a quiet /comfortable bedroom, and a cozy porch with two chairs to sit and relax. The property is beautiful and houses four unique homes/cabins, that share a perfectly manicured lawn to relax on. Linnaea was an amazing host. She responded to emails and phone calls promptly, researched ideas for sites we should check out and hikes to consider, and - best of all - prepared wonderful breakfasts each morning that she delivered to our door. Linnaea, and the owners of the property who live in one of the homes at Windsock Acres, made us feel so welcome and at home, and helped ensure we checked out the best that Creede and its gorgeous surrounding areas have to offer. We'll hopefully become regulars!"